With my youngest son away at university our household Halloween mojo has been split in two, severed if you will, covered in cobwebs and devoid of life. Okay, that’s a bit of an exaggeration, but I knew Halloween would feel different this year. My youngest has enormous Halloween spirit, and that spirit has momentarily left the building. I shook off my wistfulness and set about decorating in my abbreviated style. 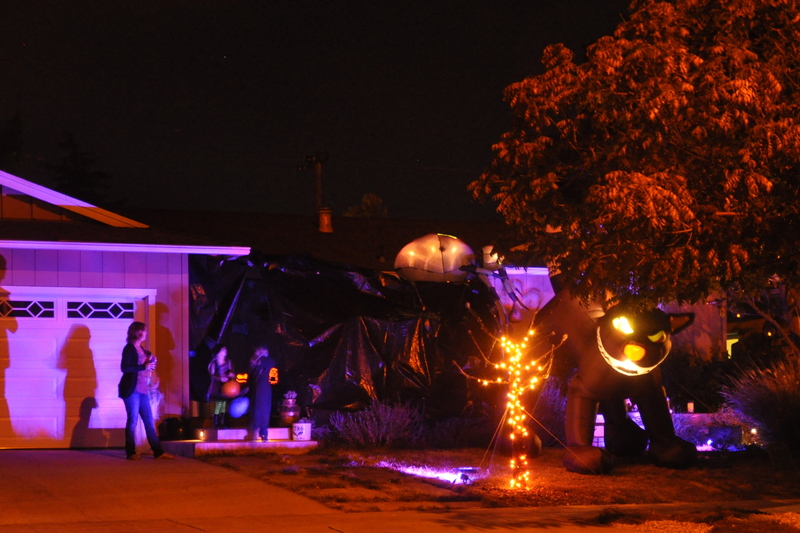 We didn’t set up the inflatables this year, and there are no teenagers at home to “build” a haunted house. 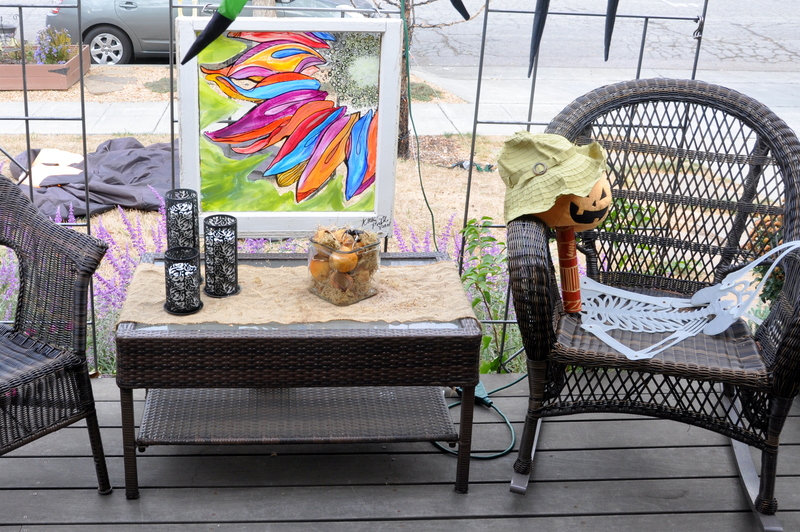 The light-catcher is up in the window, and my pumpkin collection adorns the table, now set with two places, not four. There are a few night lights lighting the way to the bathroom in the dark hours of the night. Both lights were gifts from friends. We have pumpkins, of course. The squirrels planted a few seeds last fall, and most of the vines grew in the planting box. A late-season pumpkin vine grows over the edge of the box. A friendly bee rests on my hand. My Halloween cards are also simple this year. I pulled out my Big Shot and a few watercolor postcards and made pumpkin leaf impressions. The transfers turned out really well with the extra moisture from the leaf absorbed into the paper. They have a nice, organic scent to them too, though I’m not sure it will last. Who doesn’t love the smell of chlorophyl? The process is simple. While the leaves are freshly harvested, you sandwich the leaf against the water-color paper, then insert between folded scrap paper before running it through the Big Shot. The leaves have a lot of moisture, so the extra paper helps absorb it. After drying, and pressing the cards between a hefty volume of Shakespeare, I hand-stamped a few images on the front and back of the card. I found beautiful dragon postage stamps at our local post office in orange, purple, and gold. They’re the perfect finishing touch. 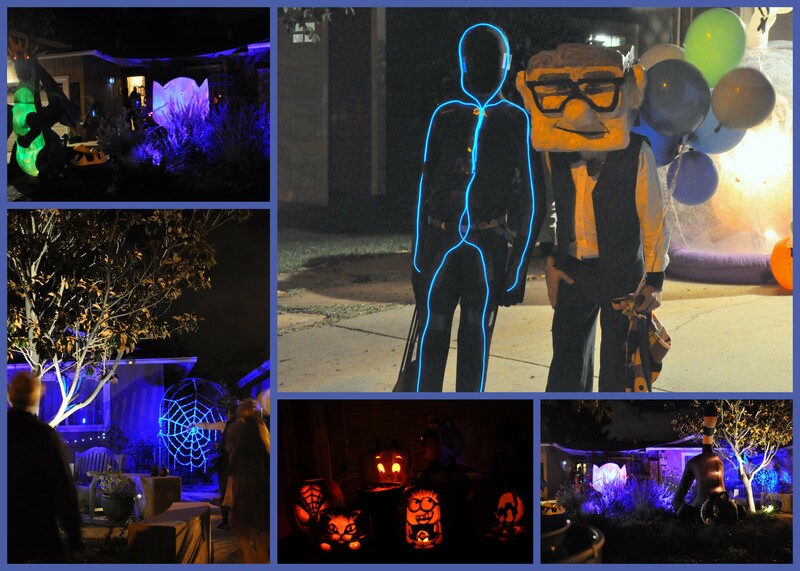 We attended one Halloween party this year, and as usual had a wonderful time. The theme this year: horror kitsch. We struggled with a concept, till one of the women at our favorite costume shop, Natasha’s Attic suggested the ghosts from the Haunted Mansion Disneyland ride. I love Natasha’s and the folks who work there. It’s a family owned business here in San Jose. They’ve been around since 1977. It takes me back to my theatre roots whenever I’m there. Natasha’s pulled together vintage pieces for us from their costume shop. We bought shoes from a charity thrift store, donned wigs and painted our faces a ghostly tint. My friend Isaac suggested seed lights to add to the ghostly effect. I sewed one strand under my skirt and another strand under Mike’s cravat. Mike’s makeup is superior to mine *and* he did it all himself. He applied latex, then makeup, and even bought a pair of “rotten teeth” for full effect. With the horrific news of this past week, Halloween gave us a welcome respite from the madness. If I haven’t said it lately, thank you for being here. My heart sings a little song with each comment and like. In a flurry of activity, Halloween came and went. October 31st landed on a Tuesday this year, but trick-or-treating children continued to ring the bell until 8:30 that night. 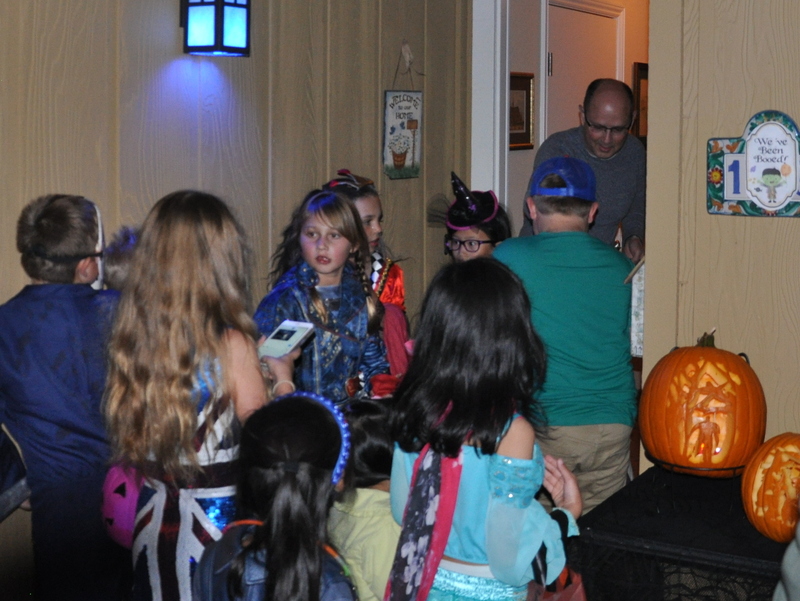 There were fewer than last year, but we still had about 300 costumed little ones at the door. Mike took the day off of work so he would have time to carve pumpkins. It’s become a yearly tradition. We ended up with six pumpkins this year. I planted three from Bonnie Plant starters, and the squirrels planted three more. 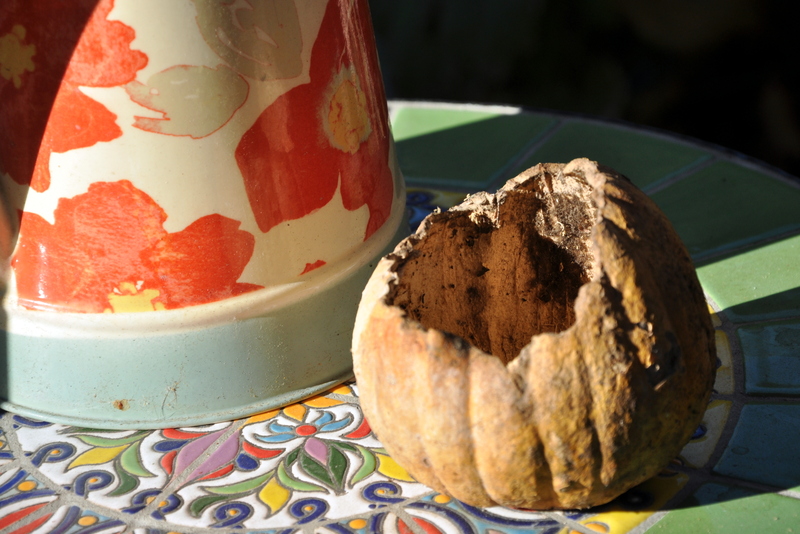 One of the pumpkins rotted in the week leading up to Halloween, but the others were hale and hearty. and finally this: I’ve had as much fun watching the squirrels “clean up” as I did when the pumpkins were whole and carved. Mike carved this the first time, the squirrel added his own interpretation. Mike came up with our costume idea this year. We dressed as “aging” (ha) black and white screen stars. We rented costumes from a local place called Natasha’s Attic. I bought a black wig but Mike’s hair is naturally dark so he just had to wear a hat. We applied grey theatrical makeup to any exposed skin, then used black mascara and white makeup for highlight and shadows. If you follow this link, you’ll see the stunning example we worked from. We’re makeup novices, but we made do with our limited skills and had fun. I helped my sister pull together her costume again this year. We’ve always enjoyed dressing up for Halloween. Sharon has MS and relies on a motorized scooter to get around so her costume has to be easy to put on and off. Last year I bought a small, decorative cat from my friend Lexi’s Etsy shop. I knew Sharon would love it, and could use it to decorate the front of her scooter. That cute little cat inspired this year’s costume! She decided to dress up like the little cat. I made a small tulle apron to match the one on the kitty, and I used one of my soft pumpkins for her wrist. 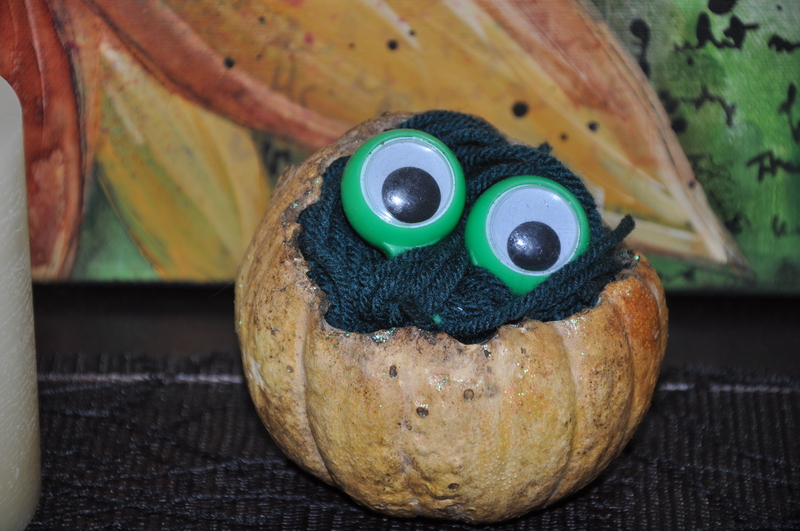 I added a scrap of green ribbon, then sewed the pumpkin to a hair tie. I picked up the cute glasses at a paper store of all places. If you follow this link to Kelly’s blog, you’ll see the two of us sporting a pair. Sharon popped out the lenses, then wore the kitty glasses over her own. 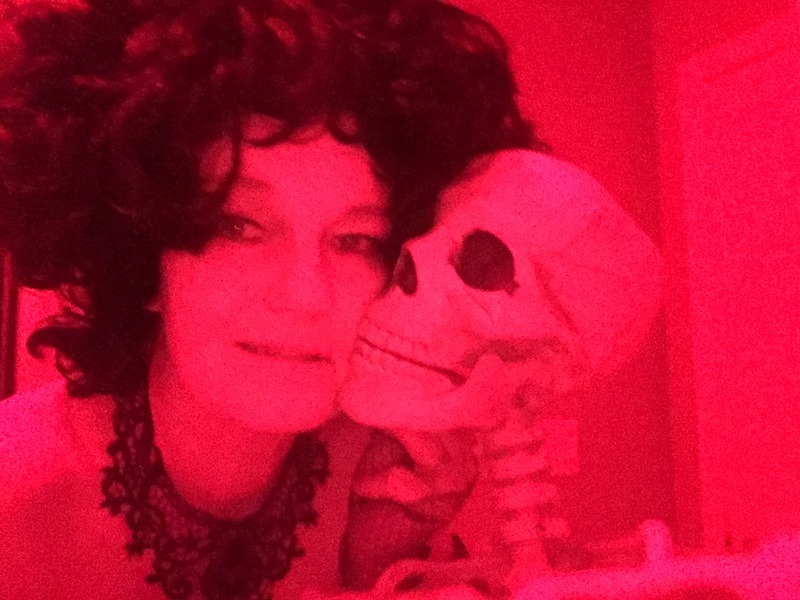 The small skeleton came from a shop in Willow Glen, and Sharon bought the faux fur scarf online. She’s always cold, so she really liked the warmth it provided. I think she’s adorable. At long last, we’re enjoying autumn-like weather. Halloween, 2017, is a wrap. 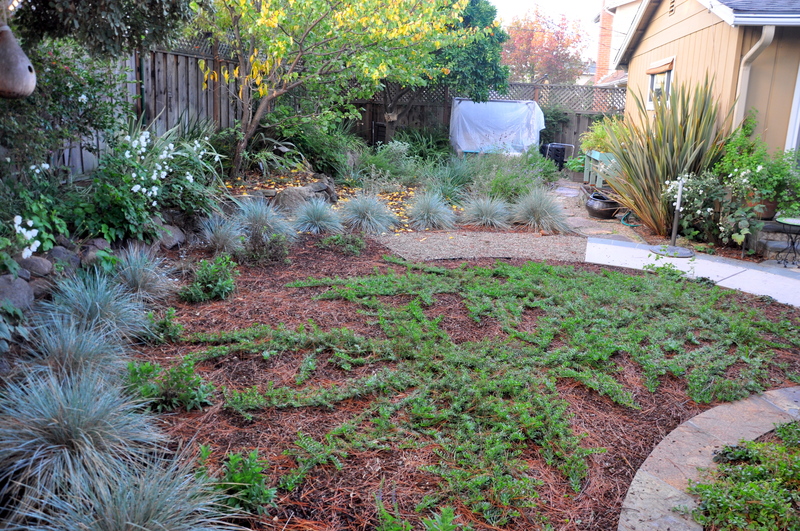 I’m excited to share photos of our garden one year later. 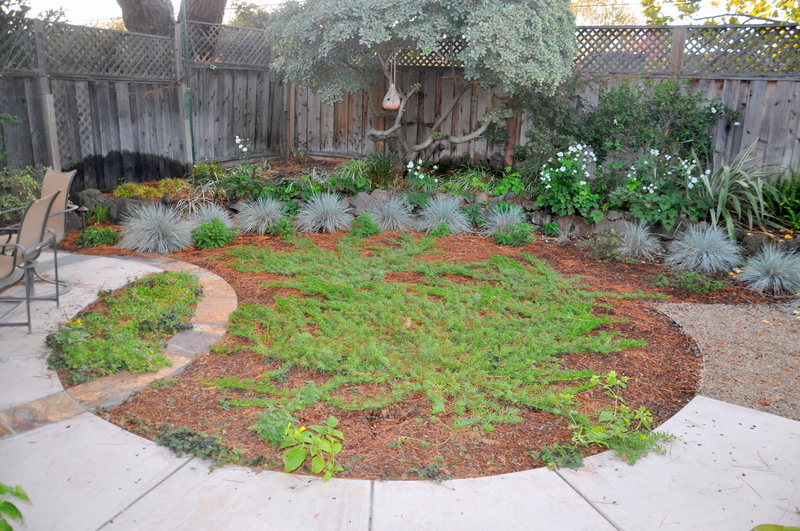 We replaced our lawn last November with drought tolerant and California native plants. 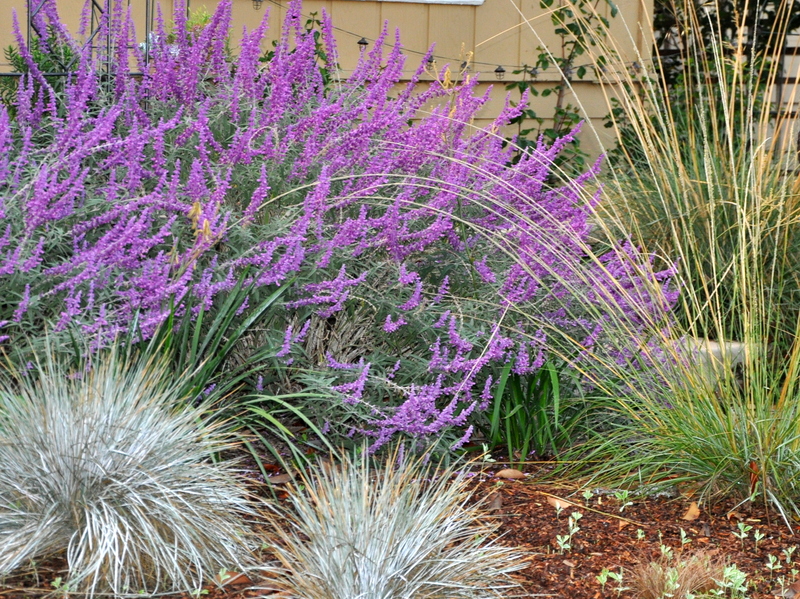 Not only do these plants survive and thrive on limited water, but they also attract hummingbirds, bees, and other beneficial insects. Those visitors are a boon to any garden. 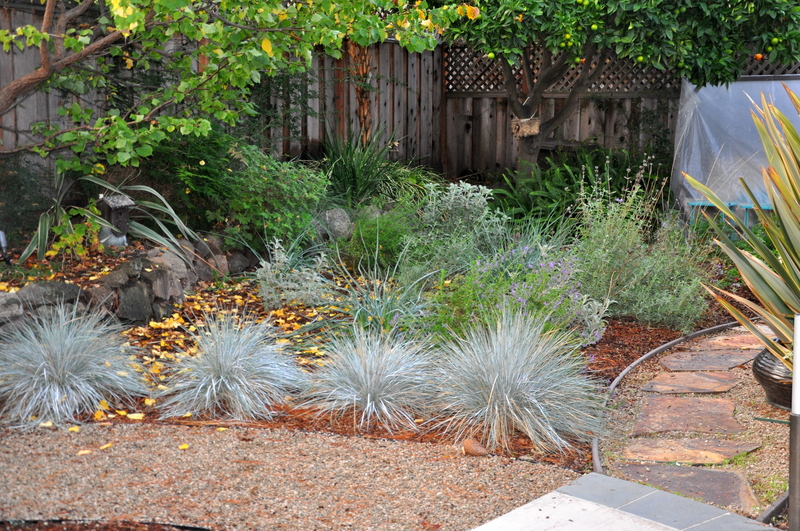 Once established, the plants only need water about once a week. 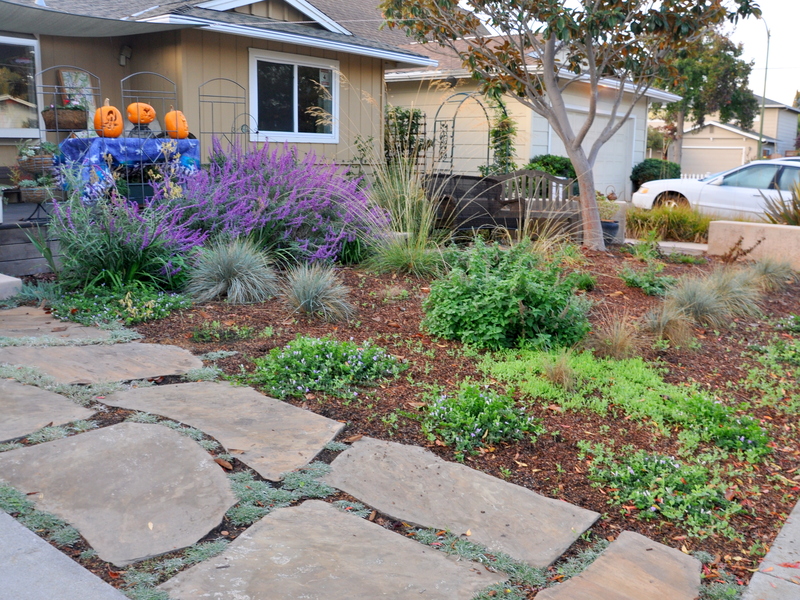 It’s been an exciting step away from the outdated monoculture of suburban lawns to a more bio-diverse garden. 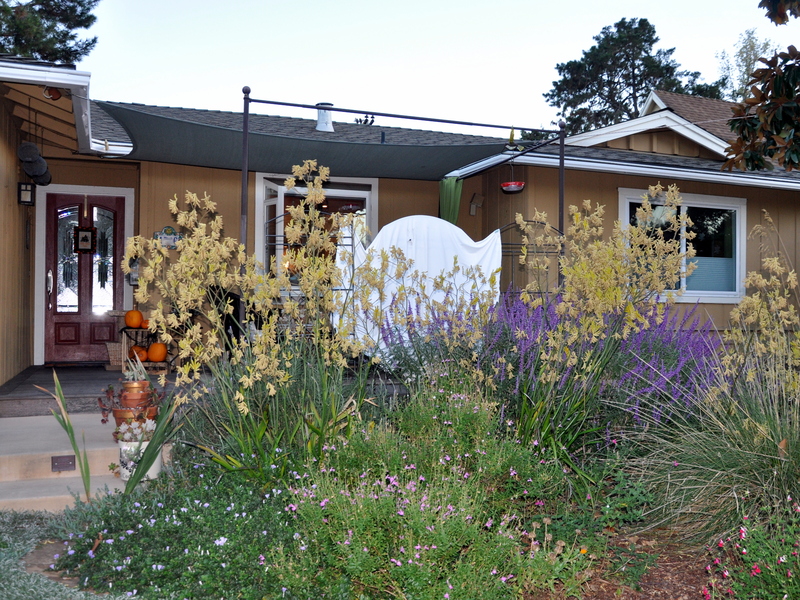 As the drought dragged on, I let go of the fantasy of a cottage garden and fully embraced a garden that fits my environment. 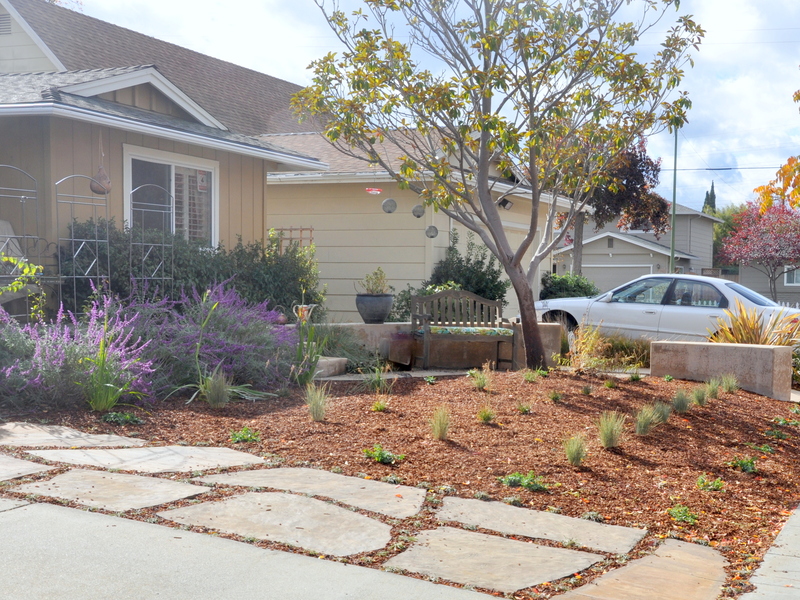 San Jose averages only 15 inches of rain a year, and virtually no rain throughout the hot summer months. Adding a rain catchment system earlier this year meant I could fill a box with tomato plants and water them guilt-free. 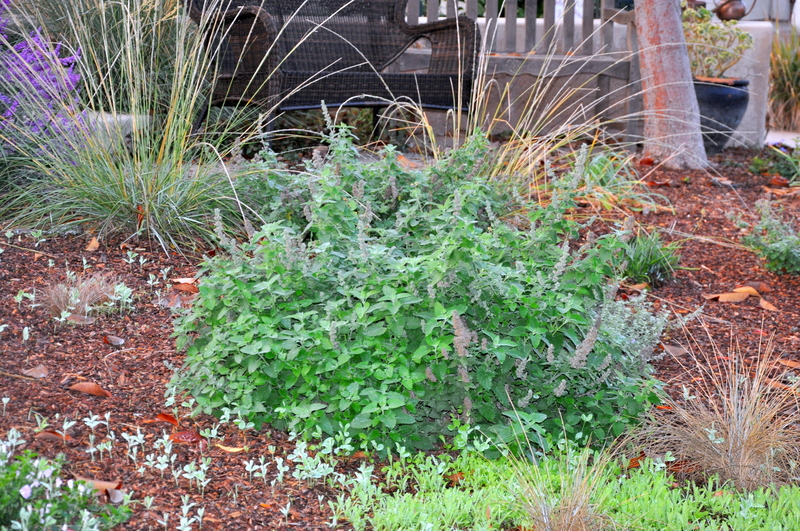 I’m also enjoying letting things be, which means making sure a weed is a weed before yanking it from the earth. We’ve had a number of self seeded flowers this year including Sweet Peas, Nigella and Mirabilis Jalapa. We’re exhausted (because we’re not twenty anymore) but boy did we have fun. We attended two Halloween costume parties, back to back. We were too darn tired for the final party, but missed out on seeing those friends. 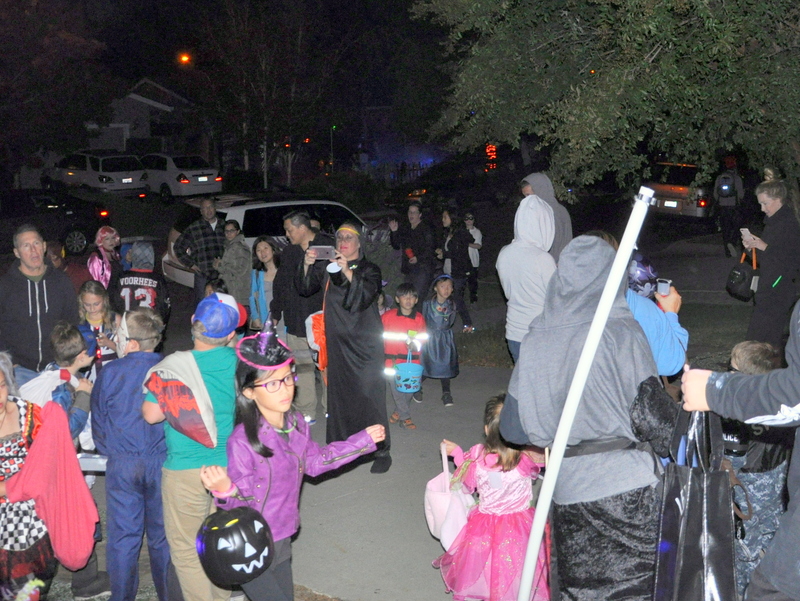 On Halloween night we opened the door to over 400 candy-seeking trick-or-treaters. Mike expertly carved four of the seven pumpkins, leaving the two round ones for my first attempt at pumpkin soup. The smallest of the seven is part of my Thanksgiving display. Our costumes needed explaining at the Friday party (what…you’re a meat pie?) but Saturday’s party was a different story. Pretty much everyone dressed up as either a character from the movie Sweeney Todd, or as someone from the Victorian era. Our hosts, who are also from the UK, served a variety of traditional meat pies, but included a vegetarian option for yours truly. They really got everyone in the spirit. We played a few games, danced and Martin gave all the guys a pretend shave, fully embracing his role as host and the deranged barber, Sweeney Todd. Diane dressed as Mrs. Lovett. You’ll see photos of the two of us and other party-goers in the short video clip below. 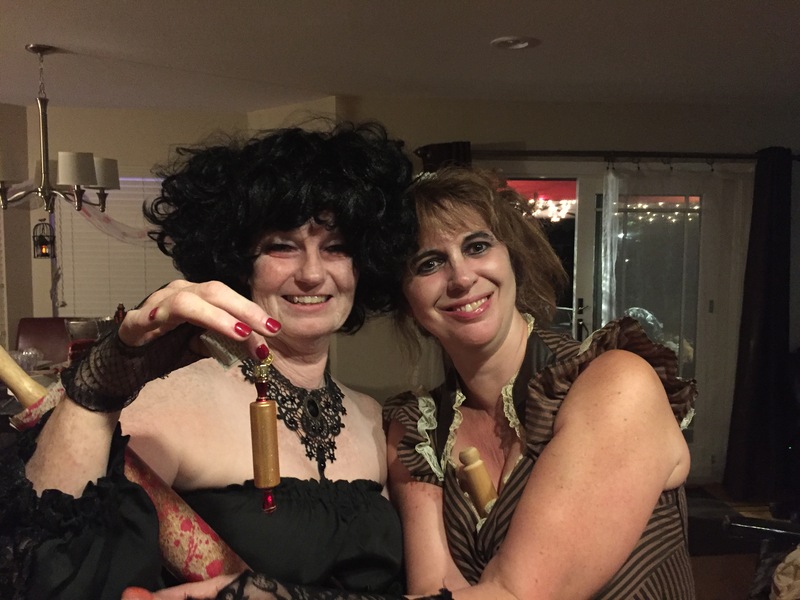 My lovely host awarded me the prize for best female costume at the second party. I’m pretty sure it was my crazy wig that pushed things over the top. I bumped into this skeleton in the lady’s room. The cheek! All in all, it’s been a fabulous Halloween season. Who knows where this month went. It was here just a moment ago, a freshly turned page on my wall calendar. I think the unseasonably warm weather led me to believe it was still August…or September. Is it really October 28th? Only four more days of Halloween fun. I had a restless night with so much rattling around in my brain. I got up around 5 am and finished Mike’s costume. We have a party tonight and two more tomorrow. I really cut things close this year. Life doesn’t stop just because I want to play all month-long. That said, I squeezed in a lot. 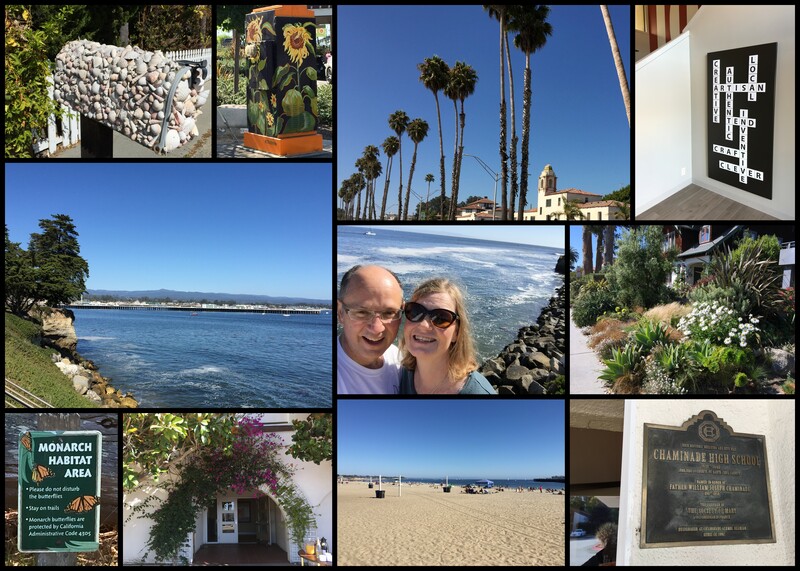 I celebrated my birthday weekend in Santa Cruz. It coincided with Mike’s company picnic along the Boardwalk, so we celebrated with work friends, then slipped away for some shopping, dinner, a movie and a night’s stay at Chaminade. We had lovely weather and a relaxing time. All month-long, friends and family treated me to dinner, high tea, a movie, a live show, wonderful cards and thoughtful gifts making me feel just like one of those entitled white men we’re always hearing about. (cough-cough) It’s nice to be pampered, eh? 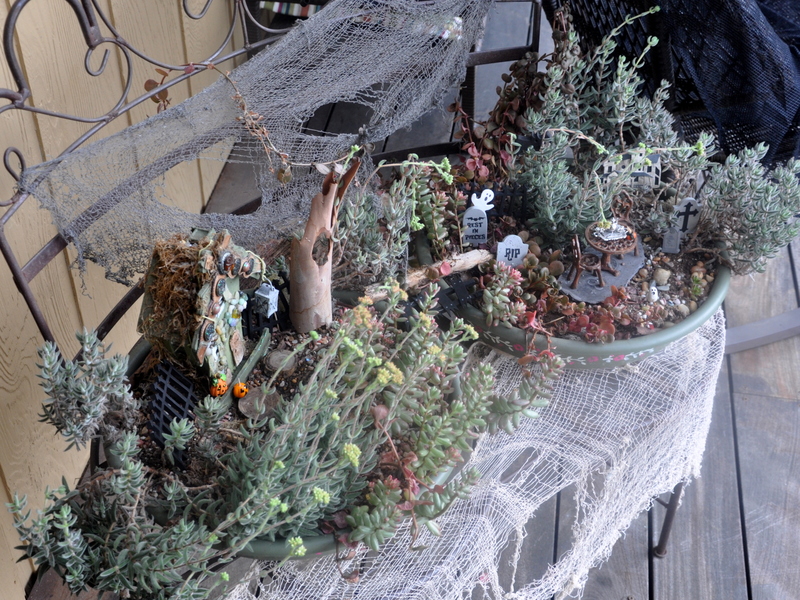 I took a four-hour crafting class with my sister where we created a mixed media Haunted Graveyard. It inspired lots of additional Halloween card making at home. 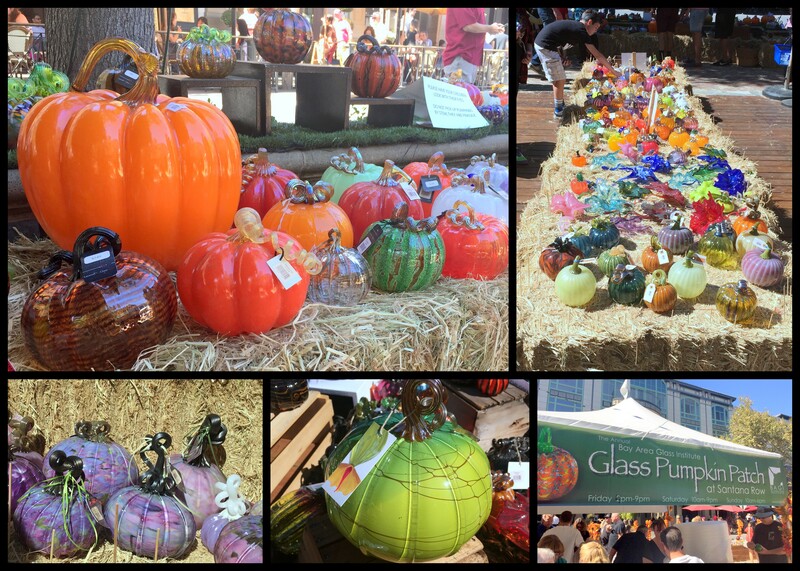 She took me out to lunch at one of our favorite restaurants at Santana Row, then we browsed the glass pumpkins on display. The last of the pumpkins are off the vine. In the end, three different plants produced seven pumpkins. What a generous bounty. I enjoy arranging them in different places around the house, as they await carving day. That makes me smile. 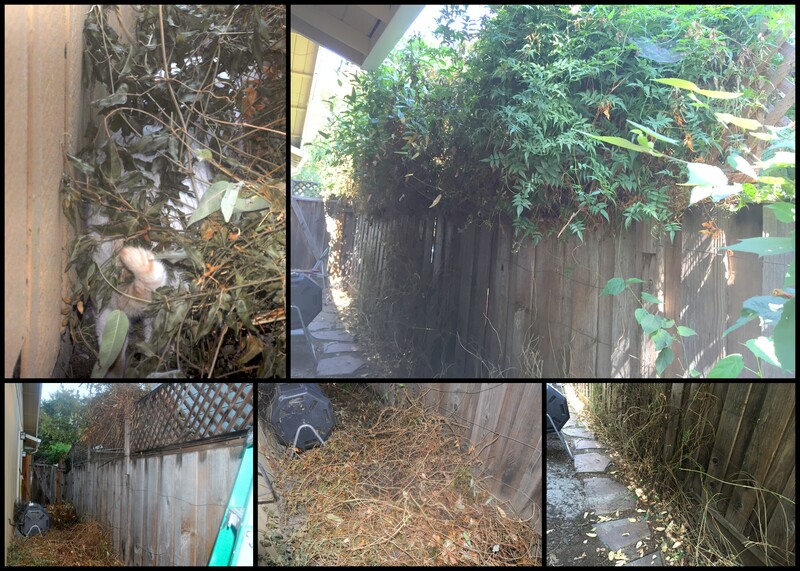 Over the course of this month, I’ve spent hours pruning three vines away from the side yard fence. Up and down the ladder I went, using best practices to remain safe and still favoring my surgical foot. There will be no accidents on my watch! 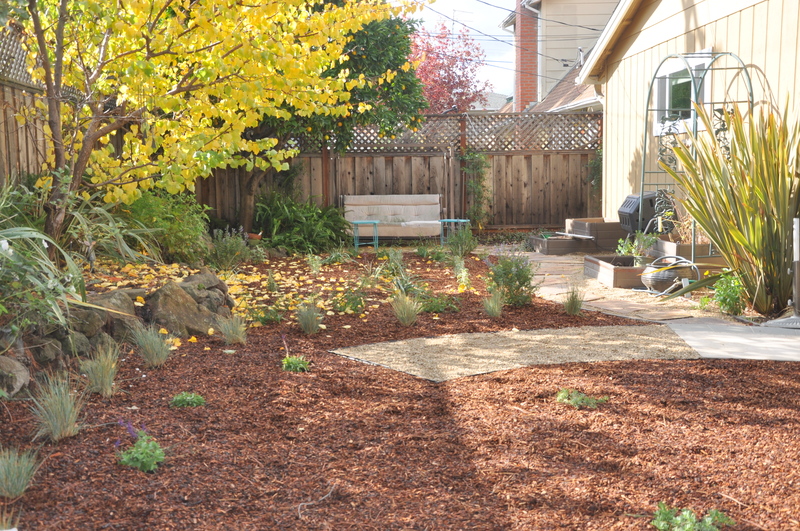 Now that the vines are off the fence, I need to start getting quotes to replace it. Broken boards, dry rot and possible termite damage stayed hidden behind the vines. No wonder I’ve been putting off this big job. It’s finally done and I have the sore neck, dull tools and blisters to prove it. And since I’m a blogger, I have pictures too. Ha! 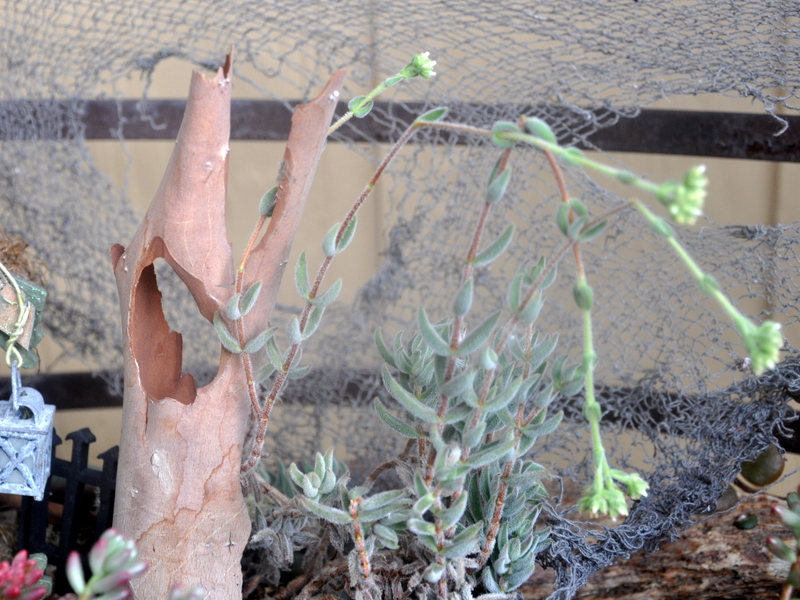 Vines intertwined in the lattice-work made it tricky to free the tangled mess. That’s Mouse the Cat’s tail exploring the scattered vines. 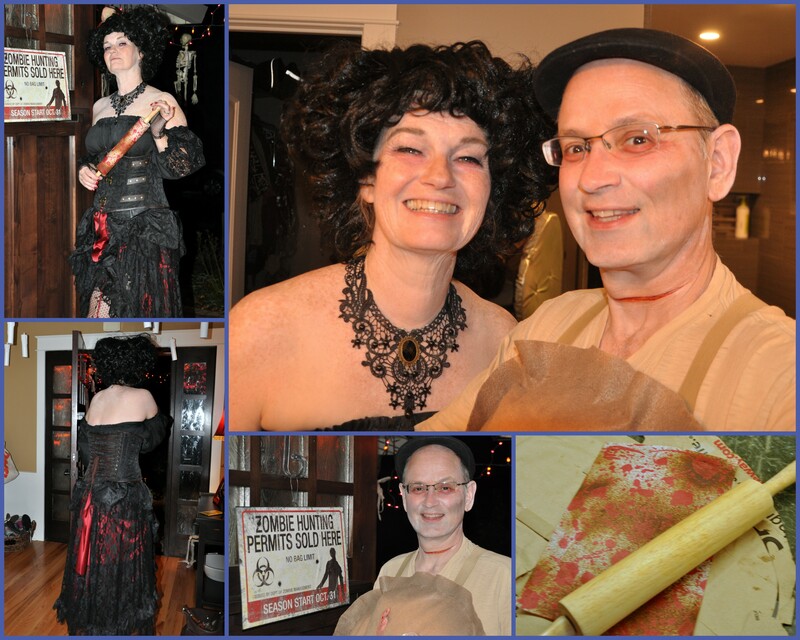 We’ve been invited to three costume parties this season, but only one with a specific theme: Sweeney Todd. If you’re not familiar with this gruesome musical, you can read about it here. It’s been a penny dreadful serial, a stage musical, and most recently a film starring Johnny Depp and Helena Bonham Carter. We rented the movie to learn more about the characters, and frankly I found it dark and dreary, beginning to end. There are only three female characters, Mrs. Lovett the baker, Sweeney Todd’s young wife shown in brief flashbacks, and later his teenage daughter. Not a lot to choose from. 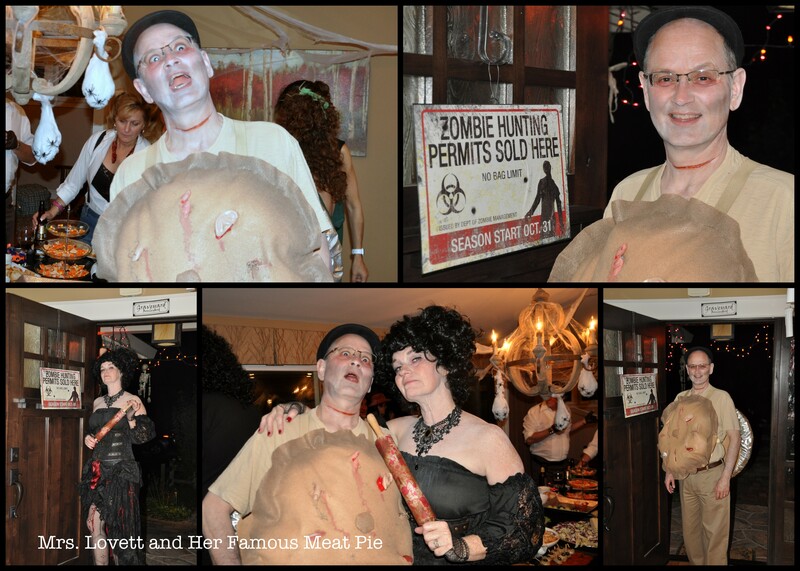 Since I like to mix things up a bit, I decided to dress as the baker, and make my husband into one of her meat pies. They’re not any old pies, by the way. After the barber slits his client’s throat, they’re cooked in the oven and baked into pies. Did I mention how gruesome the story is? Paper bag pattern (my favorite), distressed inks and stains, silver lame fabric covering a pie-shaped piece of foam, distressed fabric and the back side of the pie tin. I cut two circles of tan-colored felt, then sprayed the edges with stain for a distressed (baked) look. 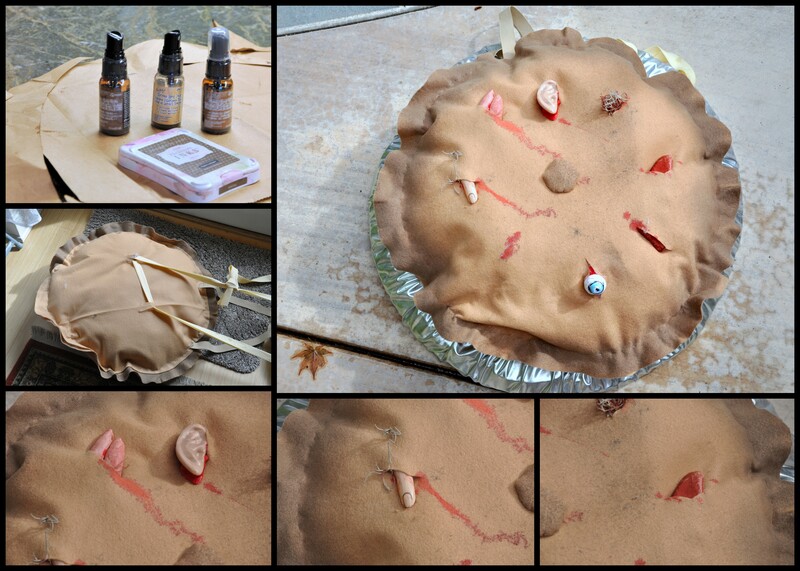 I hand-sewed the two pieces together, stuffed with batting and made slits for various gruesome body parts. A bit of theatrical blood adds drama. I rented my costume from a family owned shop called Natasha’s Attic. They pulled together all the pieces I needed including Victorian era boots, tights, lace gloves and layers of dresses. I love that place and all the wonderfully creative people who work there. I bought a crazy wig ’cause that’s how I roll, and if I get the makeup just so I’ll be unrecognizable. Stay tuned for pics of both of us in costume. 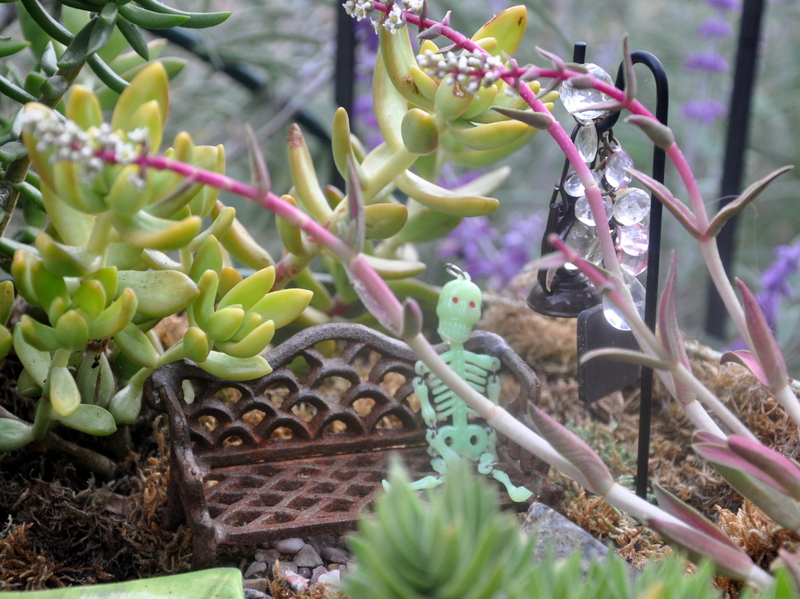 Of course I had to make time to bewitch the fairy gardens. 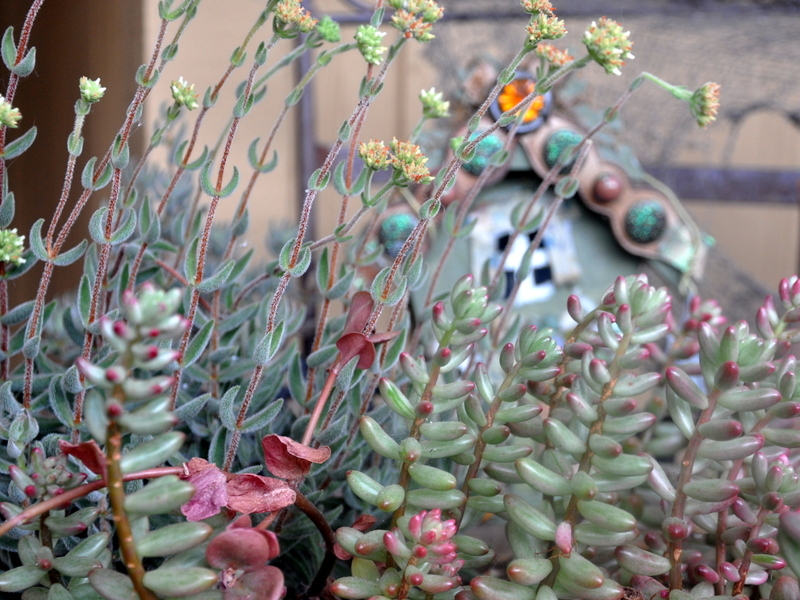 The succulents loved this summer’s heat, and doubled in size, making the garden look over-grown. Perfect for Halloween! How do I get so lucky? A wonderful package arrived shortly before my birthday, all the way from New Zealand. Pauline of the Contented Crafter says it’s been in the making for a while. 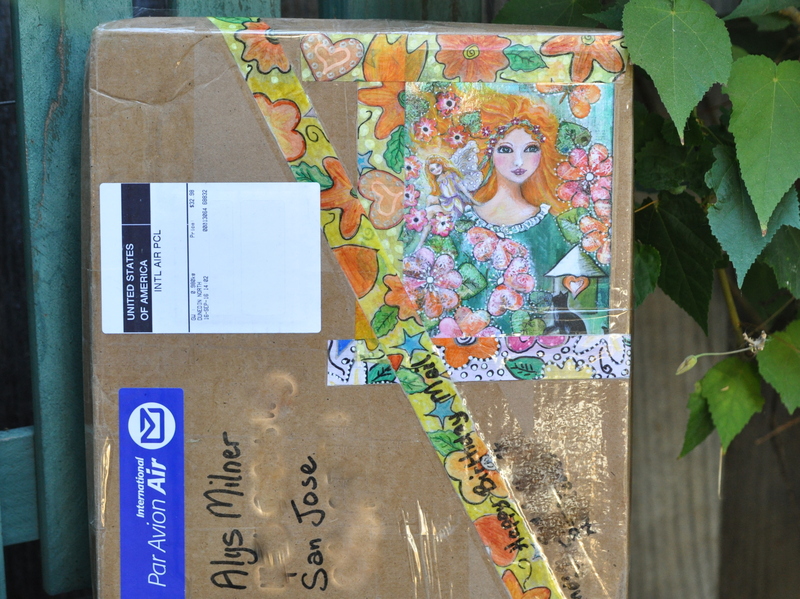 She decorated the box with her own customized decorative tape which you can read more about here. Isn’t it cool? She created the art for the postcard as well using postage stamps from my dad’s collection. The original hangs on my wall. It’s quite special. This isn’t any old spider web. 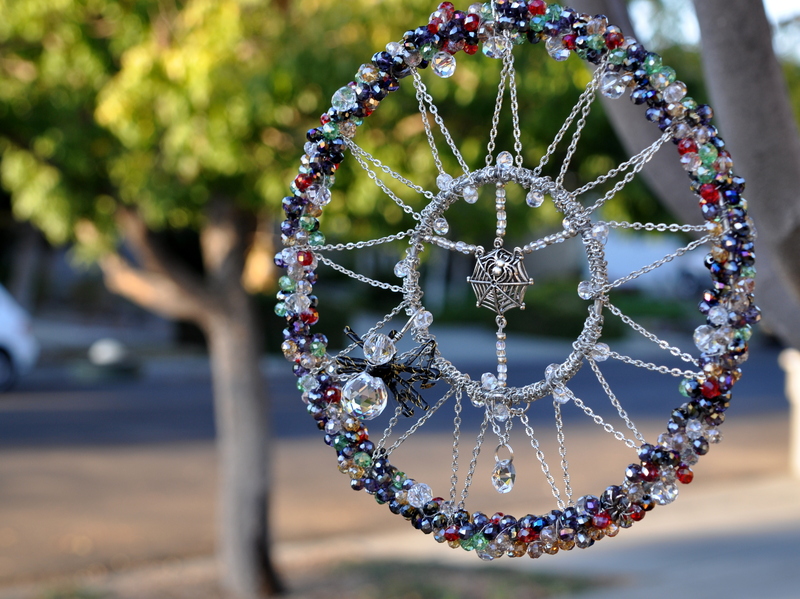 It’s a hand-crafted, bead-encrusted, gem of a birthday/Halloween gift from Pauline. I love it! My special spider web arrived with an impressively sized, faceted spider with its own hook (but no fangs). You can move her around the web, then watch it catch the light. Guess what else was in the box? 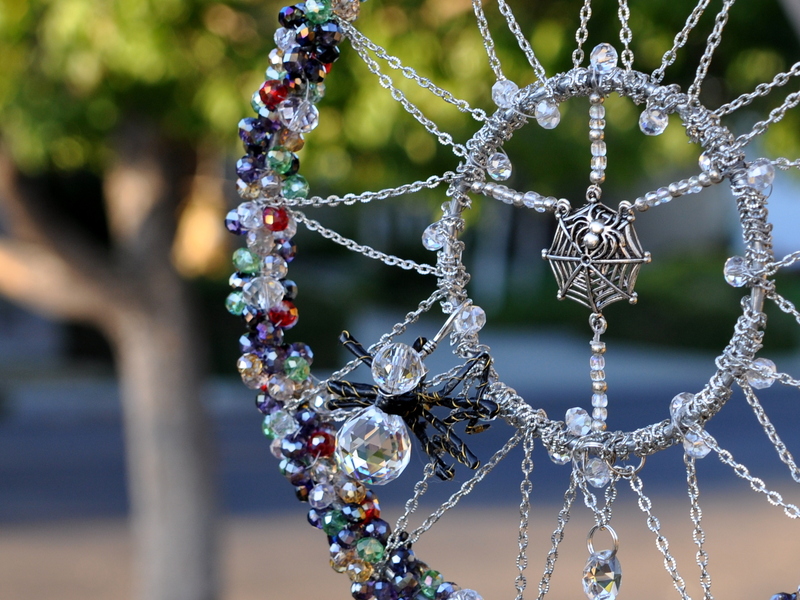 A Halloween-themed light catcher. 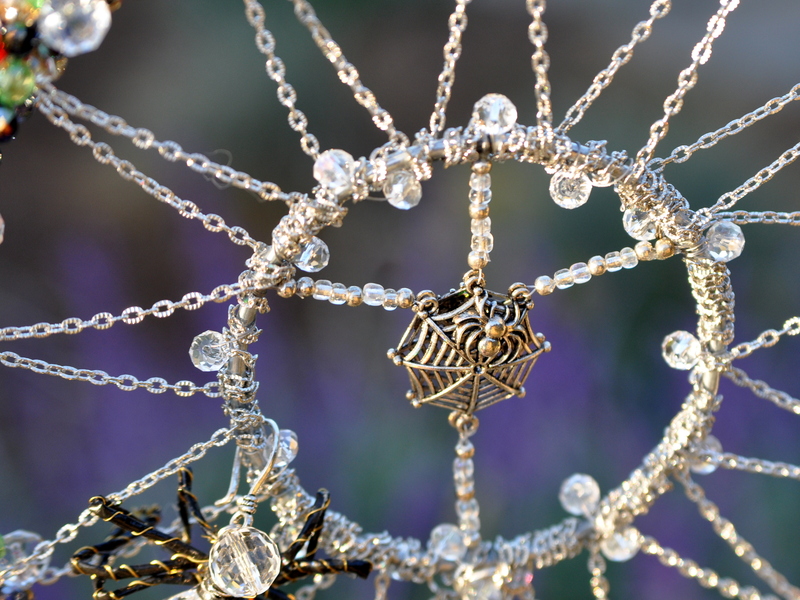 The charms include spiders, witches hats, cats and brooms. Did I mention the pumpkins? There are several of those too. The reflective nature of the faceted glass makes it difficult to photograph, so I took some video as well. It will give you an idea of the light and movement. Mike installed hooks in the nook above the sink so I could hang the web near the light. Interestingly, the web is just as beautiful at night. The lower light mutes some of the colors, while the facets shine. The stunning sunflowers are a gift from Laurie, surrounded by birthday cards and condolences on losing Slinky. The sunflower painting was a gift from Kelly last year. My mother never liked a fuss on her birthday, so I grew up following suit. A few close friends sent greetings through the mail or by phone which I loved, but I otherwise kept my birthday a secret. I’ve come to realize that I like a bit of a fuss. Not a loud, brash, in your face fuss, but the warm greetings that arrive by post. I love receiving cards in the mail. Happy birthday wishes via Facebook and blogging are a delight as well. I smile at the beautifully animated e-cards and the thoughtful friends who send them. My friend Carrielin calls me on my birthday every year and has since we were in college. Each greeting is a reminder of the richness of friends and family, relationships that have grown and deepened with the passing years. I feel loved beyond measure. Thank you all for making a fuss. Did I mention the second spider? Halloween came to a screeching halt at midnight, October 31st. Thanks to the end of Daylight Savings Time, the clocks rolled back an hour the next day. We spent part of Sunday putting things away and adjusting to the time change. We’ll leave our Jack ‘o Lanterns on the deck until the inevitable decay. 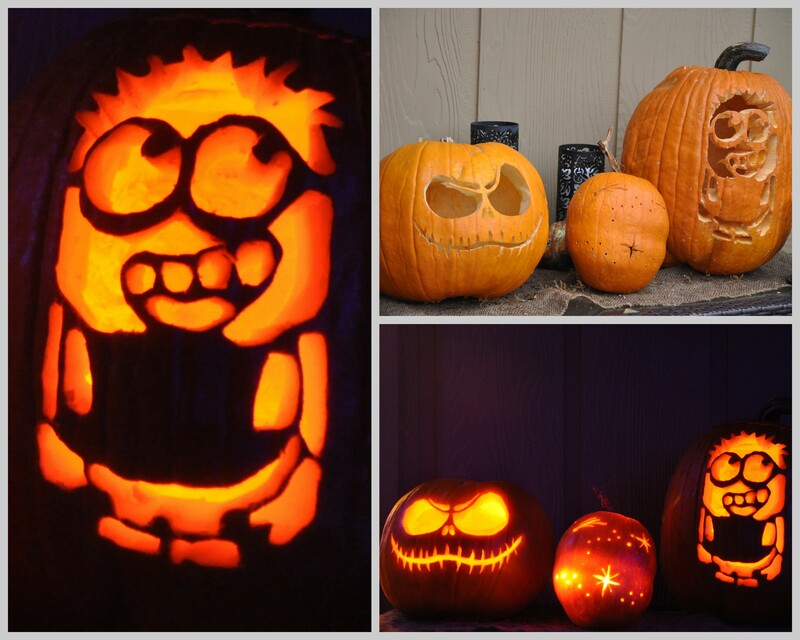 Mike’s pumpkin carvings were as wonderful as ever. He carved three masterpieces, two from commercially bought pumpkins and the third one from our garden: The Great Drought Pumpkin of 2015. The tall, slender pumpkin is a Minion for the popular children’s movie. The squat pumpkin is Jack Skellington. Jack is a fictional character and the protagonist of the 1993 film The Nightmare Before Christmas. 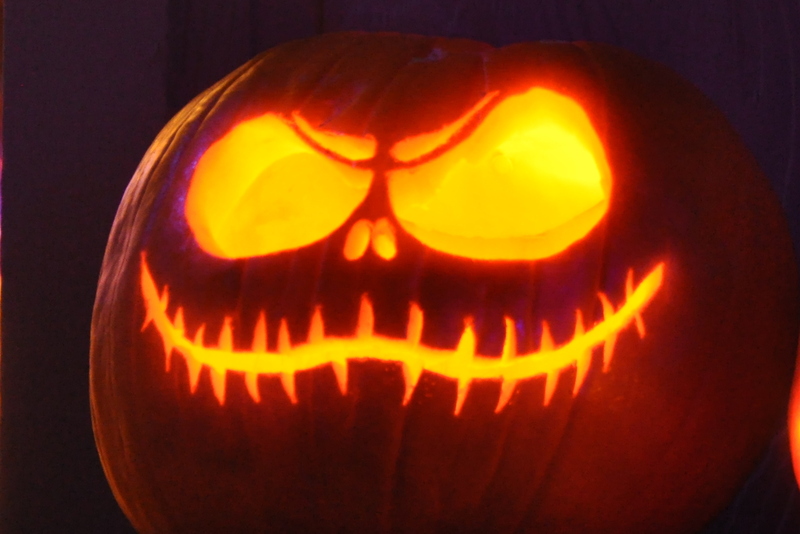 Jack is the Pumpkin King of Halloween Town and lives in a fantasy world based solely on the Halloween holiday. 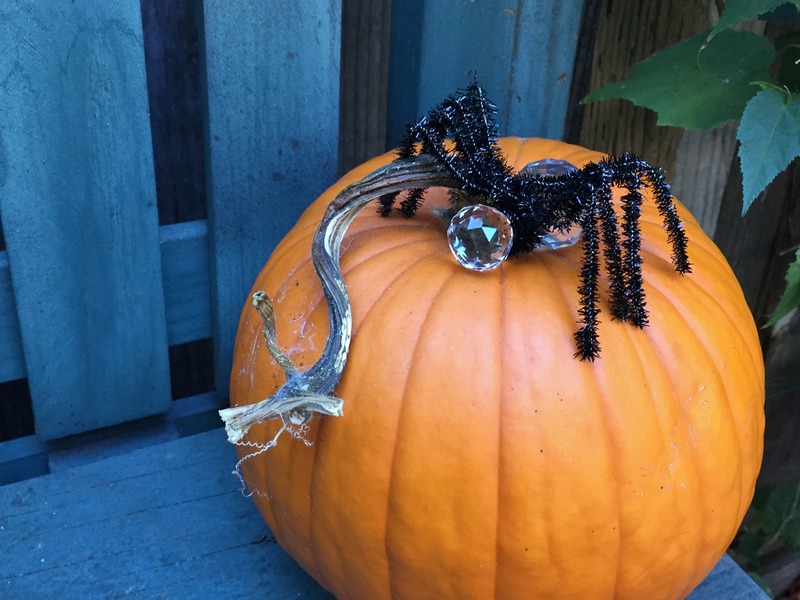 I found inspiration for the smaller pumpkin from a fellow blogger. 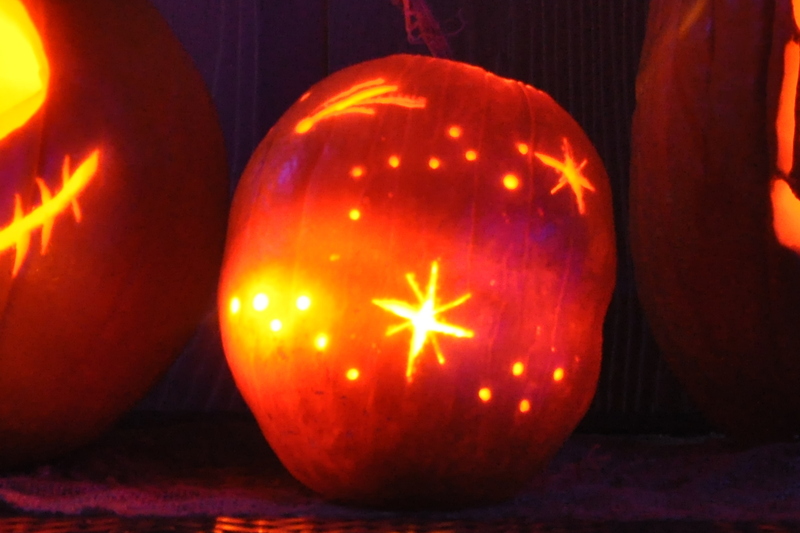 Mike used small saws and a drill to create the stars. It’s our beacon of light. My sister and I celebrated our birthdays together with a cheese fondue and salad lunch and a full-screen viewing of My Fair Lady. That beautiful movie just turned fifty years old. (We’re still older). Today I woke up to rain. 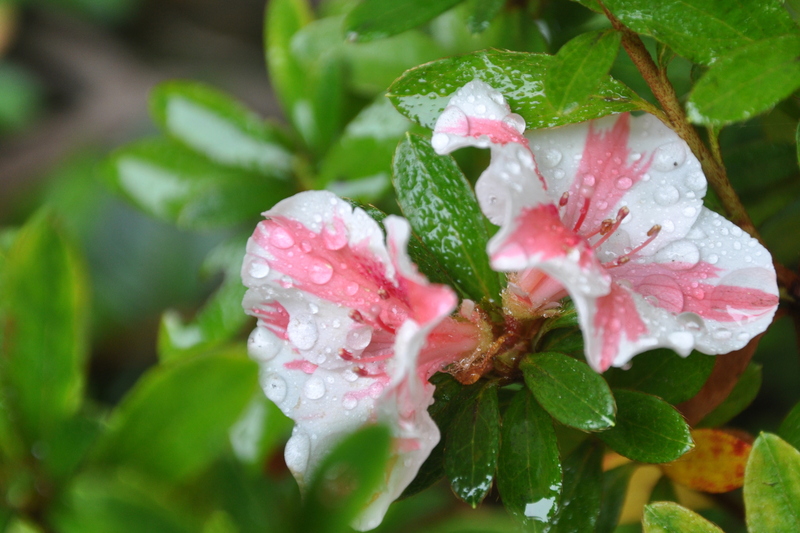 In other parts of the world, rain is a big bore, something to endure till the next sunny spell. Here in our drought-parched state it’s the topic of conversation on Facebook. I woke up at 3:30 this morning and could hear the rain coming down outside my window. Large, musical drops fell and fell and fell. I stepped out on the deck in my bare feet with my camera, wanting to preserve the moment. Then I came back inside to warm my toes and grab a few more hours of sleep. Bliss! As I write this late in the afternoon, the wind is beginning to howl. Be still my heart. It might just rain again! 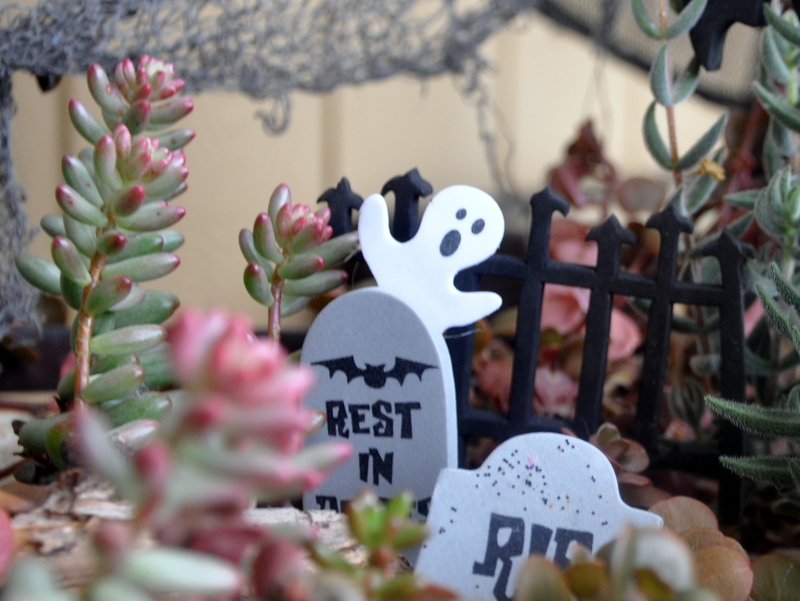 This is my favorite time of year to decorate. 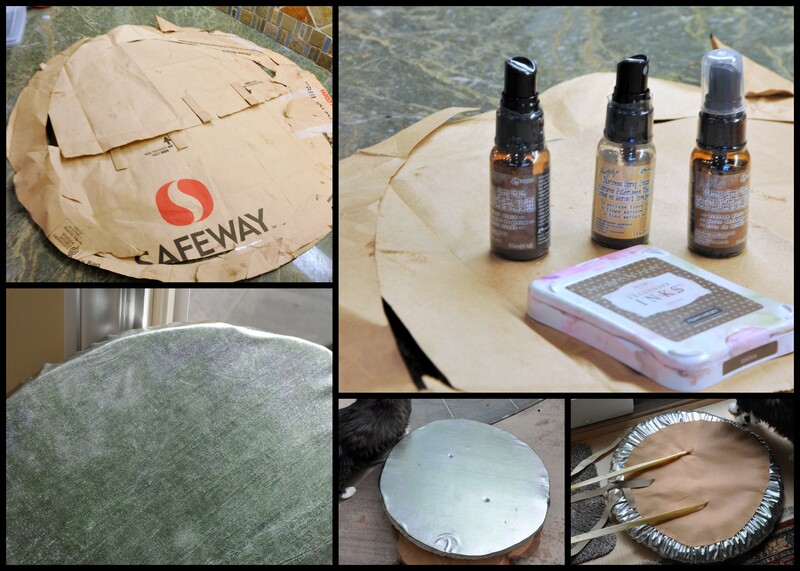 It’s fun cobbling things together, letting my creative juices flow. My 15-year-old son also loves to decorate using over-sized lawn inflatables. Between the two of us, we draw lots of passersby, though with the under five set, my son is the reigning champ. That’s Boomdee on her recent visit, checking out the dragon after dark. 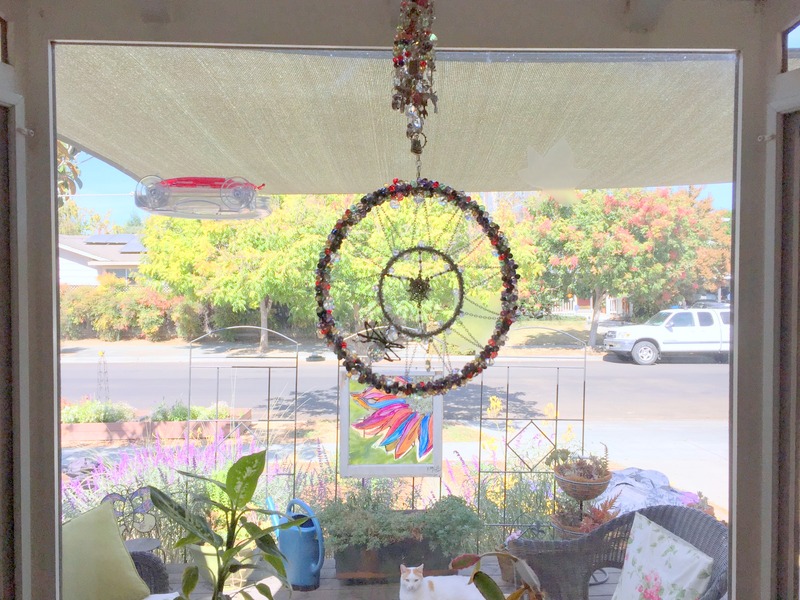 Our home office and kitchen both face the street, so part of the fun for me is watching others enjoy the decorations. 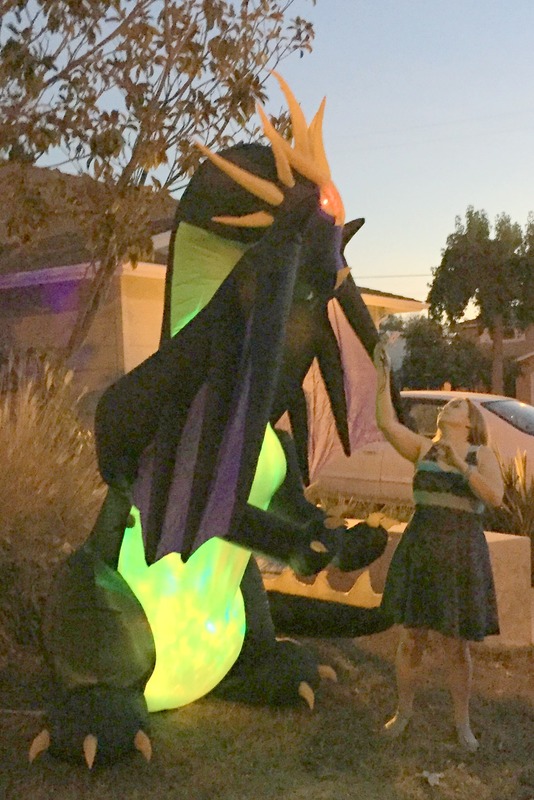 Neighbors stop to comment and occasionally pose for pictures with the giant cat or dragon. My next door neighbor runs a daycare, so those children run and play between the inflatables in the late afternoon as they wait for their parents. Occasionally the inflatables annoy one or two dogs, which makes me smile. 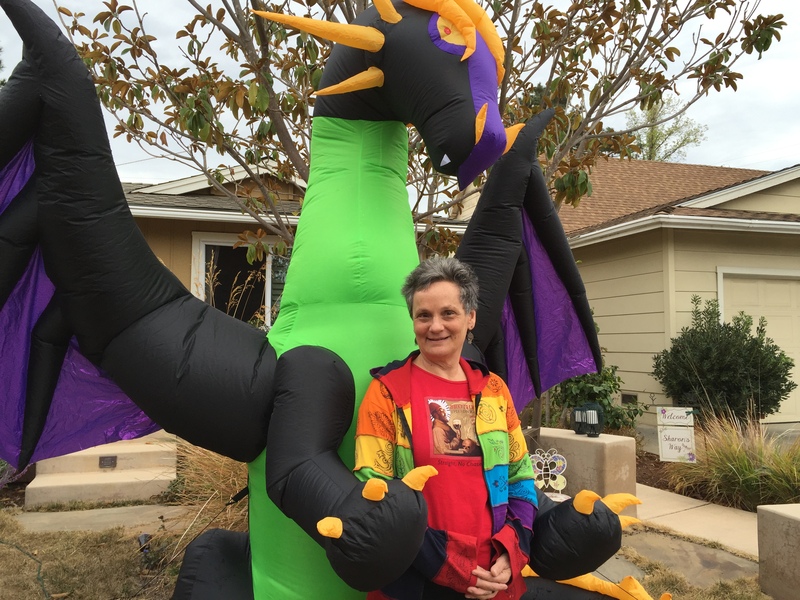 It’s hard to imagine what must go through the dog’s head when he sees a towering dragon suddenly appear on his daily walk. Lots of barking ensues, but by Halloween, even the dogs have sorted out real from pretend. In short, it’s a lot of fun outside my window this time of year. Throughout the summer, tree rats feast on our oranges, then drop the hollowed rind to the ground. Most of the fruit decays, but several simply dried leaving a hard shell. One of them reminded me of Edvard Munch’s famous painting The Scream. I started collecting the hardened rinds and created a display. 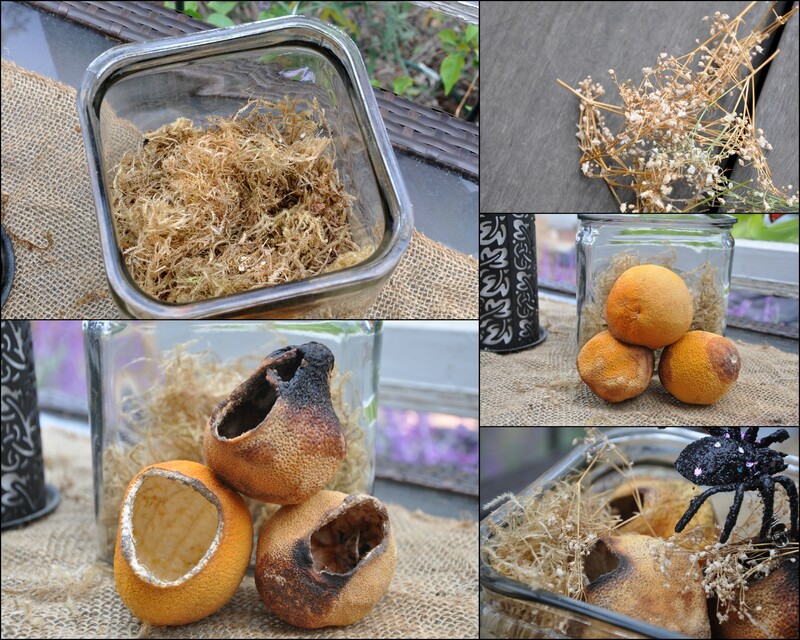 I used one of my glass vases, some dried moss, old bits of Baby’s Breath flowers and the dried oranges. 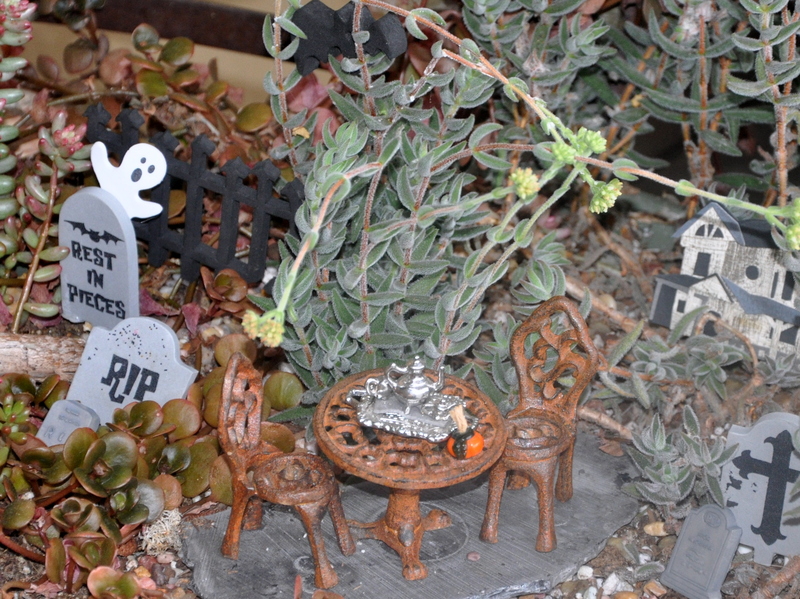 I topped it with a spooky spider for a “decadent” display. I used a burlap remnant left over from Fran’s bunting project as a table runner. You can read more about that here. Every year I haul out this old, plastic skeleton. 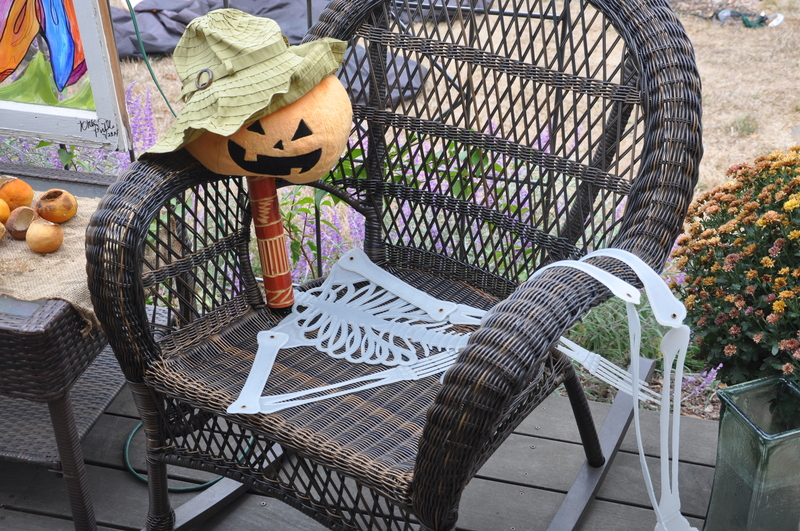 The head is long gone, so I improvised with a plush pumpkin, a rain stick and my garden hat. That’s my doppelgänger this year. She has her feet up and an elongated neck from slumping too much on the couch. I seem to need an inordinate amount of sleep lately, so when I sit in the evenings on the couch, it’s not long before I fall asleep. 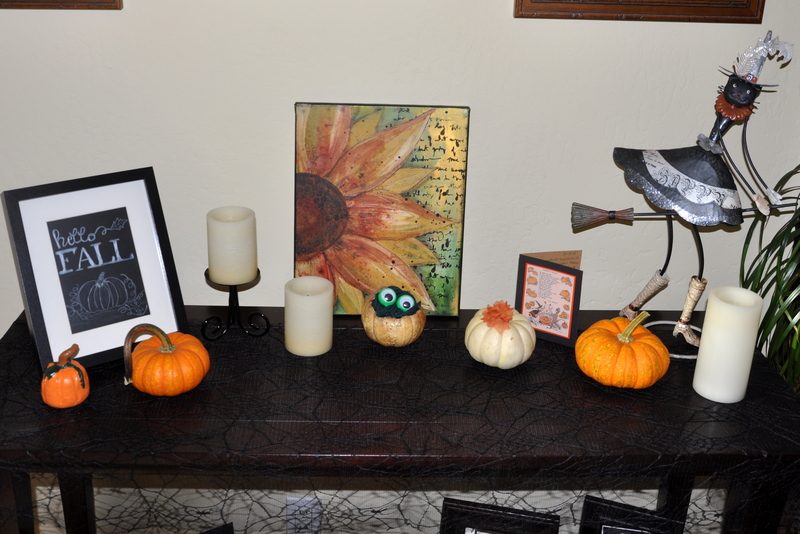 Indoors, I decorated a side table with several of my autumn and Halloween treasures. My friend Stephanie made the chalk art as a gift for last year’s birthday. 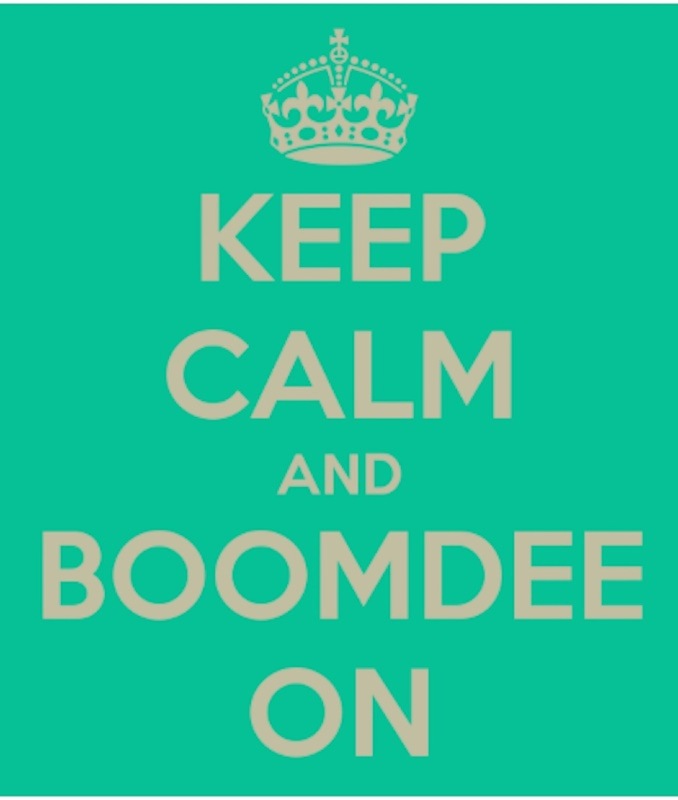 That gorgeous art canvas is the handiwork of Boomdee’s fellow Urban Girl, Lynette. Boomdee convinced her to part with this beauty and brought it all the way from Canada for my birthday. The Halloween card is also a gift, along with the bewitched cat. It’s pretty cool having a birthday and Halloween in the same month. When I turned my compost pile, a shell from last year’s pumpkin rolled out in near-perfect shape. The crown is missing but no matter. I brushed away the dirt, wiped the surface with a soft rag, and painted on a bit of sparkle. Good as new. I filled the opening with a handful of green yarn and this toy ring. 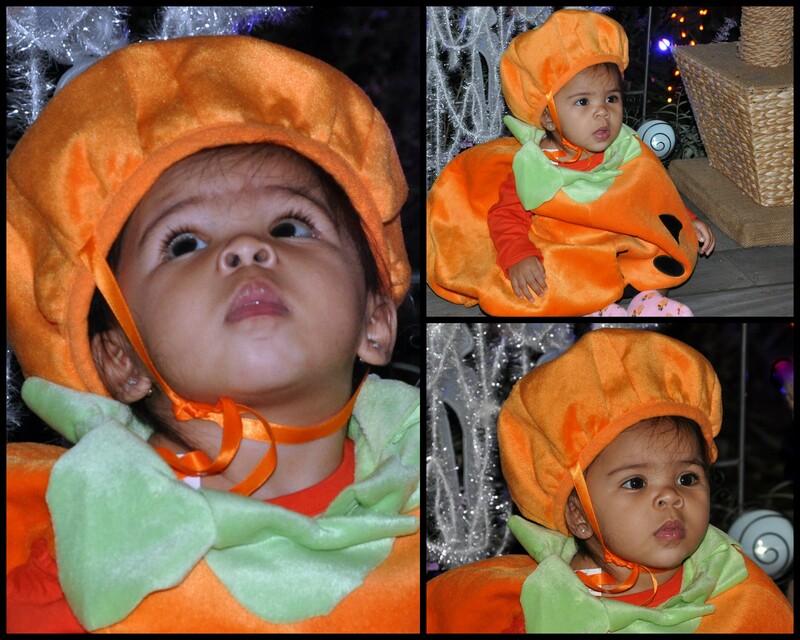 It’s my pumpkin send up to Sesame Street’s Cookie Monster. 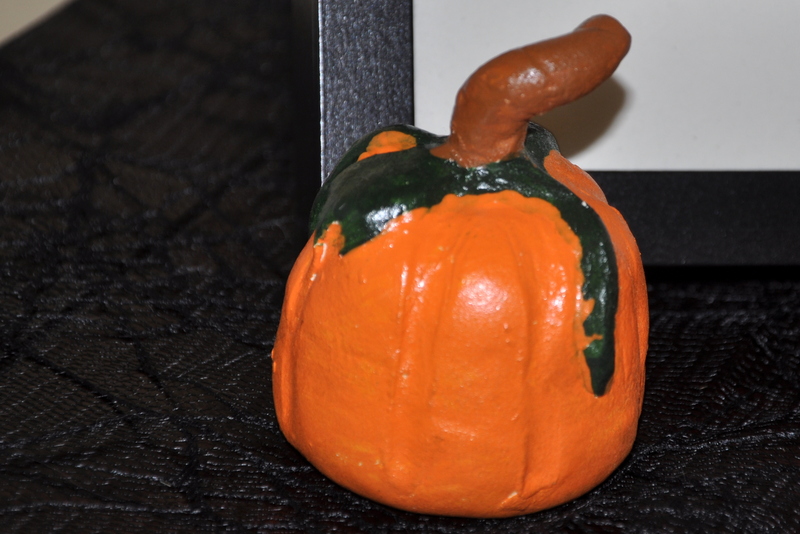 This little clay pumpkin is a favorite. My son made this in art class a few years back. 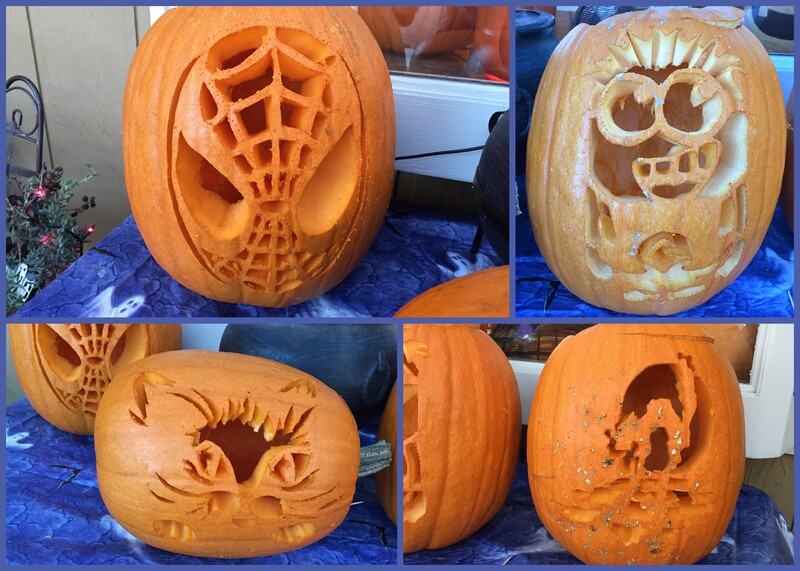 He did a nice job reproducing the details of a real pumpkin from memory. The clock is ticking. Halloween is just four days away. Do you like Halloween as much as we do?